Seriously regretted watching a documentary about Genesis the night before heading out on my latest foray. In a scene resonant from the last stumbling pages of ‘Touching the Void’, I had ‘Invisible Touch’ running around my head for most of first day of the trip, only to be replaced by the agonising Sussudio, before I was bought back to reality with more prosaic and pressing worry ‘do I have enough gas’. 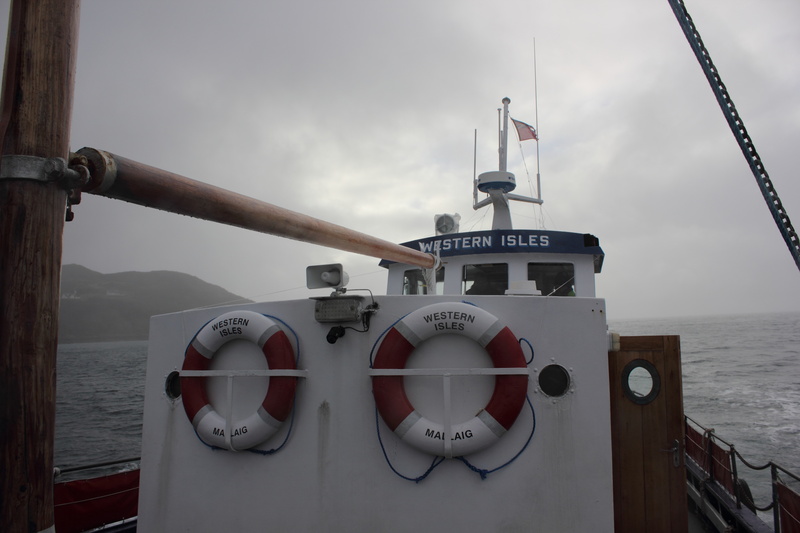 By this point I was well on my way over to Sourlies from Inverie, having caught the train up to Mallaig the morning before, and taken the afternoon ferry across Loch Nevis over to Knoydart and camped on the beach. 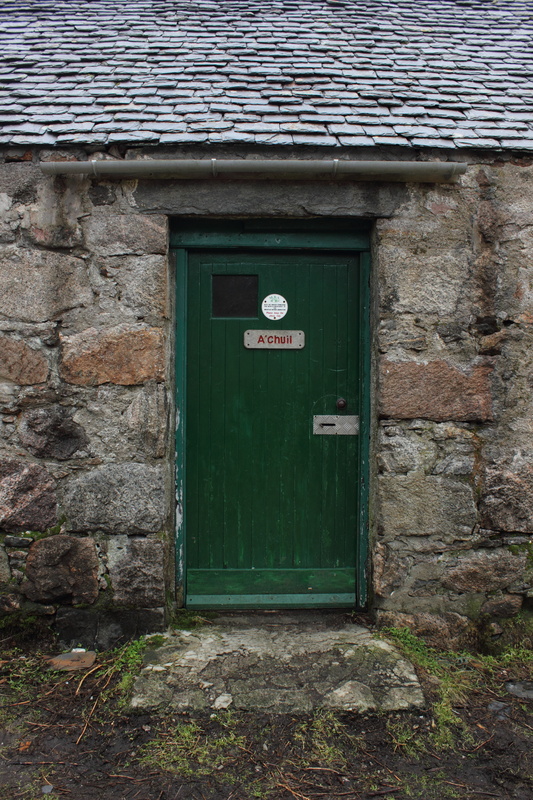 The plan was to walk through to Glenfinnan via A’chuil and maybe Glenpean, checking out the terrain and bothies for a prospective article, to follow up the piece I wrote last summer. 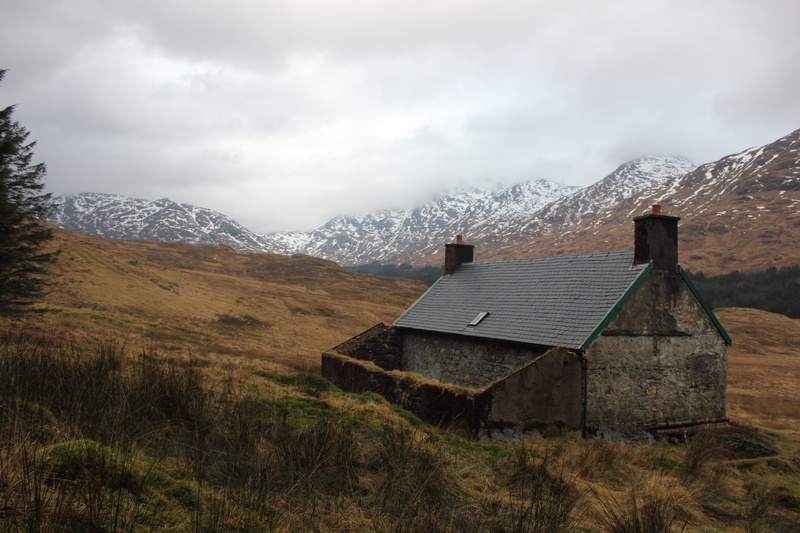 This guide to the best bothies you can get to by bike from a convenient railway station, is going to be published online at ukhillwalking.com in May, though I’m hoping the editor is going to provide a snappier title than that! Having a bit hastily committed myself to the tag bothiesonabike back in 2011, the premise of the article has made me think about the wider ethos of the blog, beyond the simple ticking off of my notional MBA list. Without getting too hippy and environmental and all that, and I do understand that I probably have more free time than most, I hope that my travels illustrate the simple fact that it is perfectly possible to explore even the more remote parts of the highlands and islands – and the borders for that matter – without immediate access to a car. 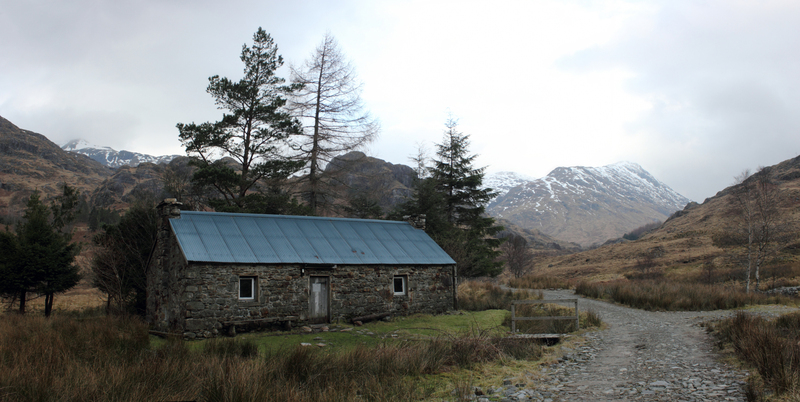 So I was thinking about classic walks that you could do A to B on public transport, and the obvious one that sprung to mind was a traverse of Knoydart and the ‘Rough Grounds’ between Loch Hourn and Loch Sheil. I’ve been lucky enough to have wandered across this area a number of times, and although its a bit showy, realised as I was sitting outside Sourlies with my first cup of tea, that it was my fifth visit since there I first ventured out to this idyllic spot some twenty odd years ago. Its still a little frustrating that no one has fixed the draw on the fireplace in all that time, and I still can’t quite get my head around that fact that are no windows facing out into the estuary, but really these are small quibbles. 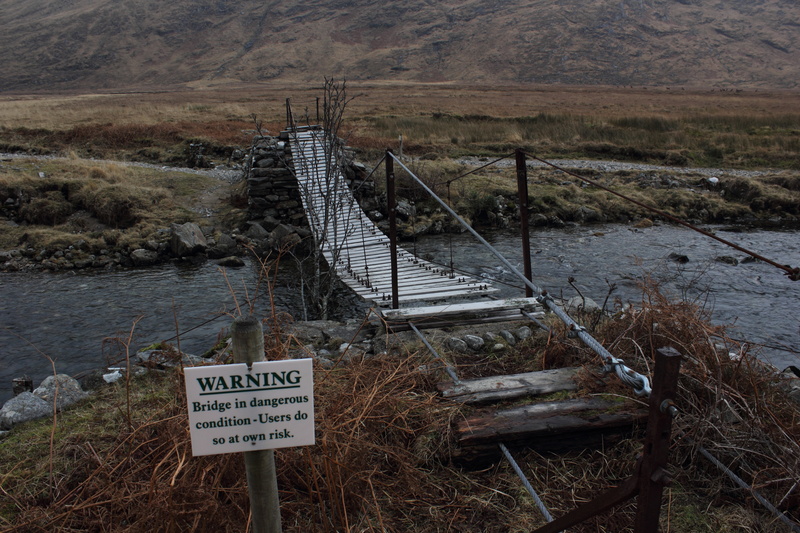 The other apprehension which had been preoccupying me as I headed from the Mam Meadail bealach and down to Carnoch, a mile or so from the bothy, was the state of the bridge over the River Carron. No one had any reliable information in Inverie, but I reasoned that most of the snow melt from the previous week had already subsided, and it was just a case of getting my feet wet if the bridge was out of action. Well its still there at least, though you do need a little Dutch courage to cross it, and its probably best to blank out the obvious warning sign, but hey it all adds to the adventure. view of the River Carron looking towards Carnoch and Loch Nevis…wot Scotland really looks like outside of the magazine photo bubble! 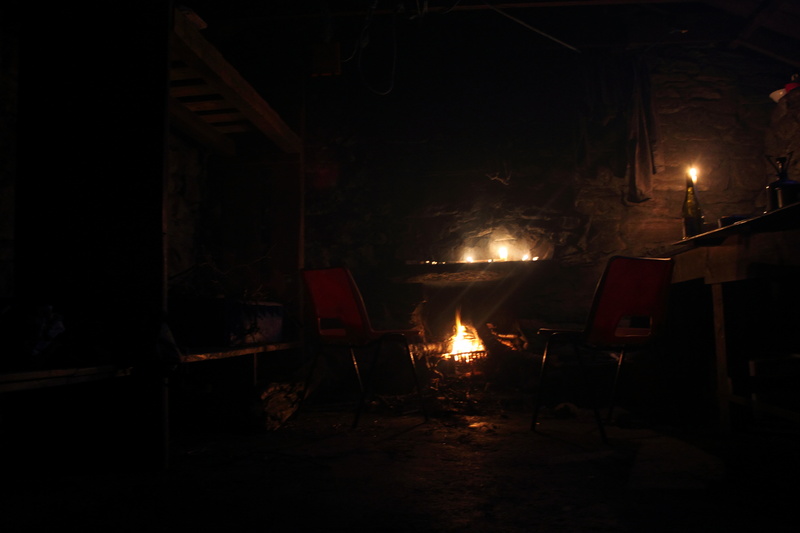 Everything was fine and dandy in the evening until I got down to taking a picture of the fire for the article. Even after all this time pretending to be a photographer, I still haven’t bought a small portable tripod for this task, so for the upteempth time I had to work the shot by balancing the camera on some semi steady platform, and hoping the image didn’t blur because you need at least a half a second exposure. Well I was so preoccupied fussing with this, that when I was actually positioning items for the shot I knocked over the bottle of wine. Jez. Fortunately I had at least already had a glass, but it was still tough to keep the annoyance to a minimum. I have to admit that I did contemplate taking a sip of my cheap cab sav as it coalesced into a puddle on the floor, but I wasn’t really that desperate was I? Well I survived the evening sober, and in the morning was aware that my head wasn’t quite as fuzzy as it normally is. In fact I was weirdly ready to seize the day at a reasonable hour. Well ten o’clock at least. Even with the time available, I decided against heading on to Glenpean, as I’d heard that a serious amount of forestry clearance work is going on there at the moment. 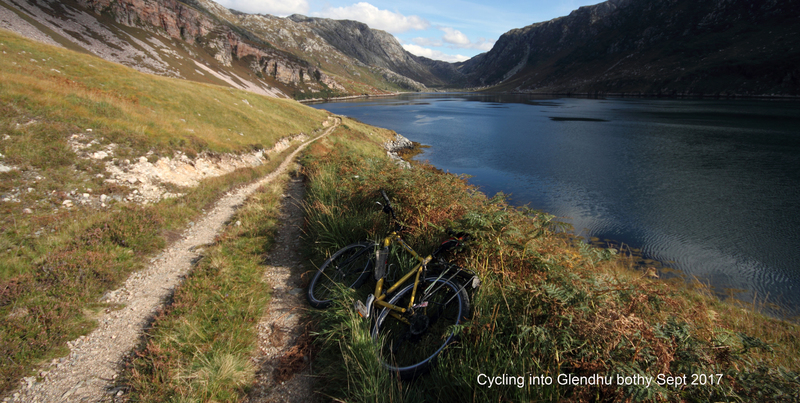 So the days objective was set for A’chuill, which is a mere five miles over the Mam na Cloich Airde, and into Glen Dessarry. There is still 350m on ascent to negotiate, but in terms of a roughty toughty challenge it is small potatoes. I took the walk pretty slowly as the ground was completely sodden, and was very happy that the sun actually came out for a few minutes, so I could get a couple of shots that could be a little more enticing to the potential magazine reader. By mid afternoon, with A’chuil in sight, my mind turned to the evenings entertainment, and the prospect of a night without any alcohol. 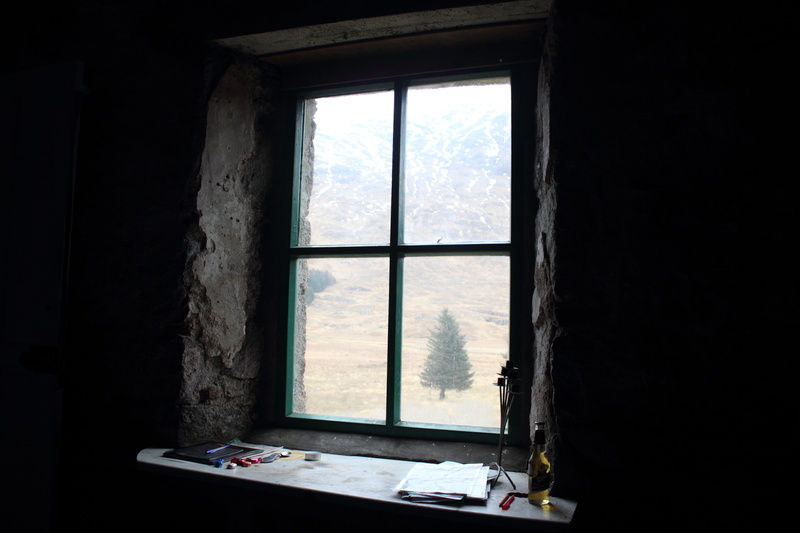 But as I approached the bothy, a vision was laid before me in the window that made my day. I kindly fellow traveller had left a bottle of beer as I gift, and very gratefully toasted them as I glugged down the contents, and settled down to cook my tea. 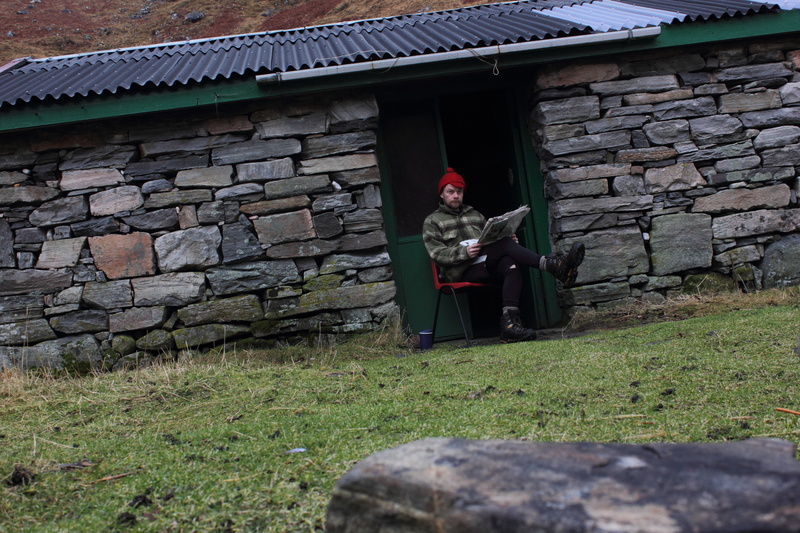 I have left the odd beer in my time, and always try and leave a full set up of wood and kindling when I leave a bothy if I can, but I did make a mental note to contrive it more often. The final push over Gleann Cuirnean the next day was not too arduous, and in fact got a little more interesting than I’d bargained for at the bealach, because of the odd slippery snow patch. 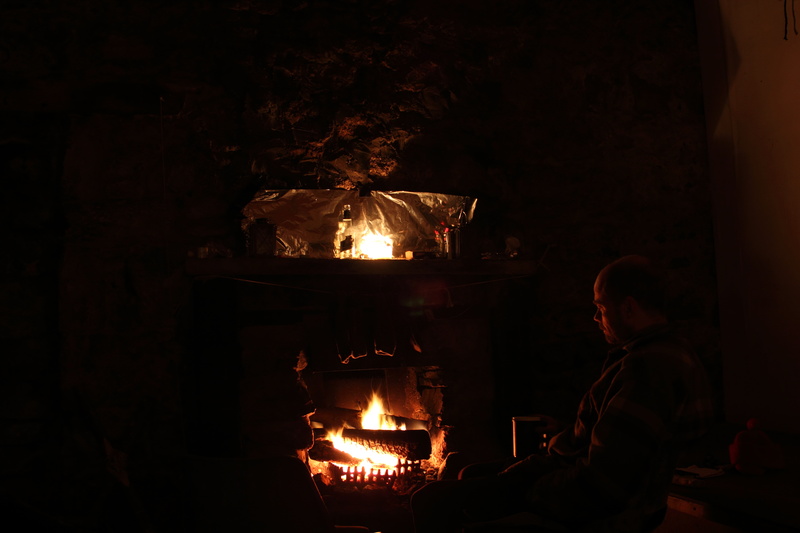 But I made it out down to Corryhully in time to have a cup of tea before the train was due at Glenfinnan, and had a bit of a chat with a party of kids who were settling in for the evening celebrating a twenty first birthday. I think I have more than enough material to work with for my article. This entry was posted in walk ins and tagged A'chuill, Corryhully, Sourlies on March 15, 2015 by bothiesonabike.